Woven suspender elastic. 2.1mm thick. 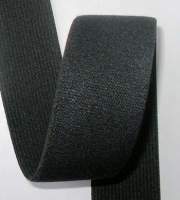 Thick elastic is great for suspenders, or use when thicker elastic is required. 5 yards per package 50 yard rolls are also available. Please contact us for pricing. Heavy woven suspender elastic. 2.5mm thick Sold in 5 yard packages. 50 yard rolls are also available. Please contact us for pricing.